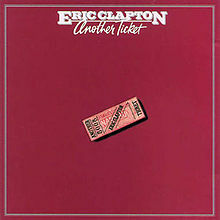 When I remembered this album by Eric Clapton in 1981, I found myself wondering why I haven’t visited any other albums he might have done in the time I have covered so far. Now, I realise that I missed both his 1978 studio album “Backless” and his tremendous 1980 live album “Just One Night.” The bad thing is that I actually listened to the live album around that time and loved it, so I have no excuse. I knew that while I journeyed through time, I would miss out the odd great album but come on. No use crying over spilled coffee, especially when “Another Ticket” is such a fine album. The reason why I am beating myself up so much over this is that I have always been a Clapton fan and really loved what he could do with a guitar. With “Another Ticket,” he plays the old fashioned blues based rock that he built his reputation on. He does this so easily on tracks like “Something Special,” “Catch Me If You Can,” the single from the album, “I Can’t Stand It,” “Floating Under the Bridge” and his cover of the Muddy Waters classic “Blow Wind Blow.” Then there is the ballad title track, which he reminds me of the similar type of hit “Wonderful Tonight” but without all the lead guitar in between. However, he also goes slightly country with the songs “Black Rose” and “Hold Me Lord” but he manages to pull it off. I love albums where the closing track goes out with great guitar playing and “Rita Mae” ends the album exactly that way. Most sane people in the world will agree that Eric Clapton is one of the greatest guitarists in the history of guitarists. I know we may know one or two that we consider better and that’s cool. But whenever great guitarists get mentioned, Eric Clapton is definitely one that gets mentioned in that group. “Another Ticket” shows why he does.